The Company Pension Dashboard allows you to review the automatic enrollment status of employees from one screen. You can also publish pension communications to OpenEnrol here as well as opt-out/opt -in employees. We have introduced the "Company pension Dashboard" to simplify the management of your AE pension schemes. From this single screen, you can process opt-ins. opt-outs, joins and cease contributions along with publishing your pension communications to the OpenEnrol service. Where can I find the Company Pension Dashboard? From here we can process employee Opt-ins, Opt-outs, joins and cease contributions. 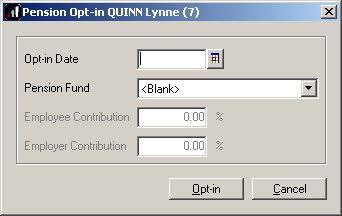 To opt-in an employee, click on their name in the Pension Dashboard list and then click the "Opt-in" button. 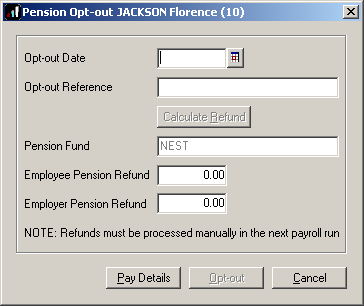 To opt-out an employee, click on their name in the Pension Dashboard list and then click the "Opt-out" button. • Click Calculate Refund - a refund may be due to the employee/employer for deductions taken between the Pay Reference Period that includes the Opt-in Date or the AE Date (whichever is the latter) and the Opt-out Date for Automatic Enrolment pensions. Click Calculate Refund to automatically calculate the amount due, this value can be adjusted if required. Click Pay Details for a breakdown of the periods and contributions used to calculate the refunds due. Employee and Employer pension deduction standard values will be set to zero and the Pension Fund set to none. A similar process to "Opt-in" but for employees who have been assessed as "Entitled". 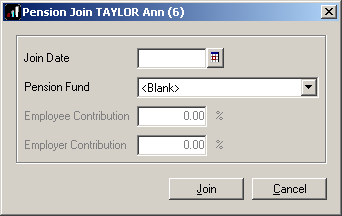 Click on the employee name in the Pension Dashboard list and then click the "Join" button. To cease an employee's contributions, click on their name in the Pension Dashboard list and then click the "Cease" button. 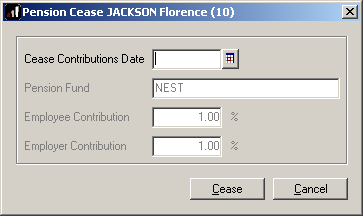 Use this screen to enter a Cease Contributions Date to stop the contributions for the individual. • was a member of a qualifying scheme before the Staging Date.